Saturday March 16, 2013, Cusco, Peru. Back at the Casa SanBlas Hotel. Yesterday started at 3:30 AM to the wake up call of a porter outside out tent. I fumbled in the dark for the zipper and reached may hand out for my morning cup of hot coffee. I had time for one sip before Deby’s cup was ready and she eagerly sat up to accept her morning offering. Yesterday ended with a 2 hour train ride, 2 hour long bus ride and finally a shuttle to our hotel for a 9:00 PM return. As badly as we wanted to crawl under the soft covers with the provided hot water bottles, we both opted for the necessary hot showers to wash off four days of hiking dirt, sweat and mud. No blog posting last night. Today we woke up early but not early enough to say goodbye to Dee Dee who needed to catch an 8:00 AM flight home. We had a fantastic time getting to know Dee Dee on the trail. You really get to know someone when you share four days of hiking, camping, sweating, climbing and fighting exhaustion, in weather that alternated between hot, cold, damp, really damp and the occasional downpour. Dee Dee showed her stuff hiking up Dead Woman’s Pass and the “Gringo Killer” like a pro. Deby and I made it but not without a little more huffing and puffing. Dee Dee, I hope you get home safe and keep in touch, we’ll miss you but not as much as Michael will, I’m sure. I’ll get to the Machu Picchu story after I catch up on a few things. This morning we met with German Canales Flores to return our backpacks and rucksacks for the trip. 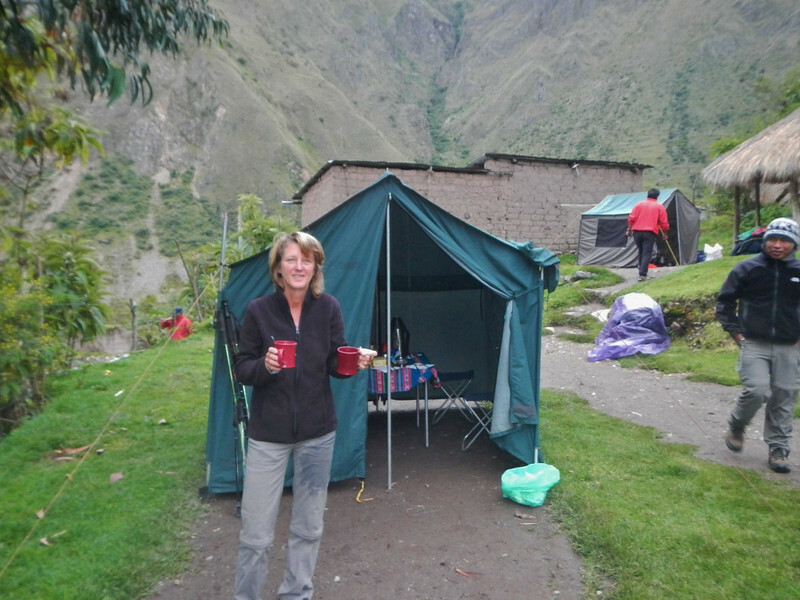 German (pronounced Her-‘man) is the owner of Viajes Destino Peru, a Peru travel company. 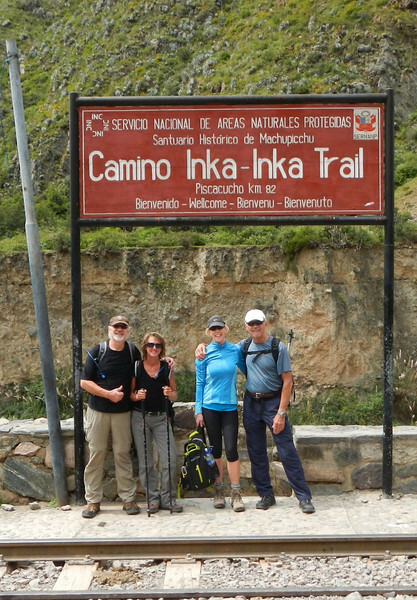 He arranged our whole Machu Picchu trip including guide, porters, transportation and the hotel. Everything was taken care of with the utmost professionalism. If you are ever in Peru and find need of any travel services he covers the whole country and can arrange tours or hotels. Click HERE for his web site. Also, before I get to the Machu Picchu tale I want to thank Alex at Peru Moto Tours for helping me get my bike fixed! Yes, while we were hiking Alex made arrangements with a local mechanic to repair my blown rear shock absorber. I thought it would need replacing but there was not one to be found in the whole country. 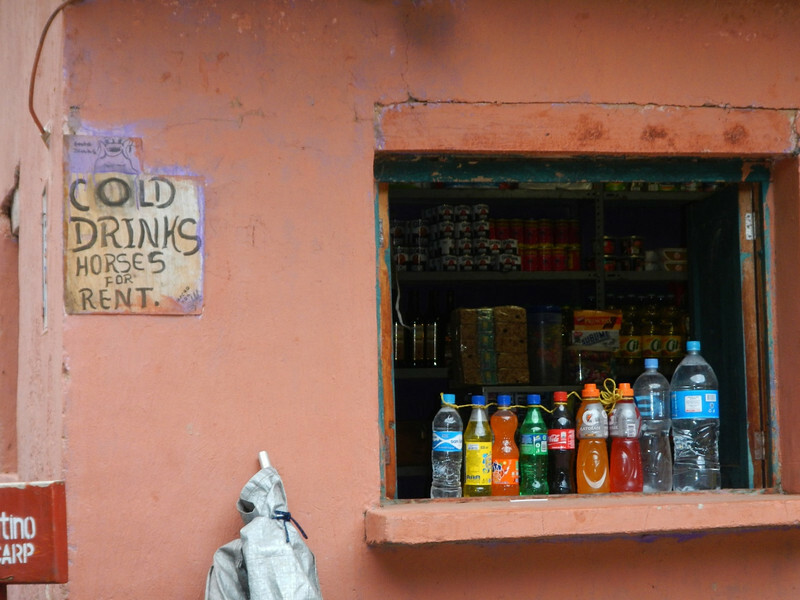 No problem for the resourceful people of Peru, if you can’t buy something fix the old one. Nice. Alex and I with the motorcycle. They not only fixed it, they did a total detail cleaning job, it hasn’t looked this clean in months! Now for the main feature……. In case not everyone is familiar with Machu Picchu, it is the most famous Inca site and was built around 1450 The Wikipedia Link HERE has a good overview. It was re-discovered in 1911 by Hiram Bingham, an explorer from Yale that is credited as being the inspiration for Indiana Jones. Our co-riders Keith and Dave visited the site 50 years ago on the original Motoraid trip. They said they were almost the only people there. 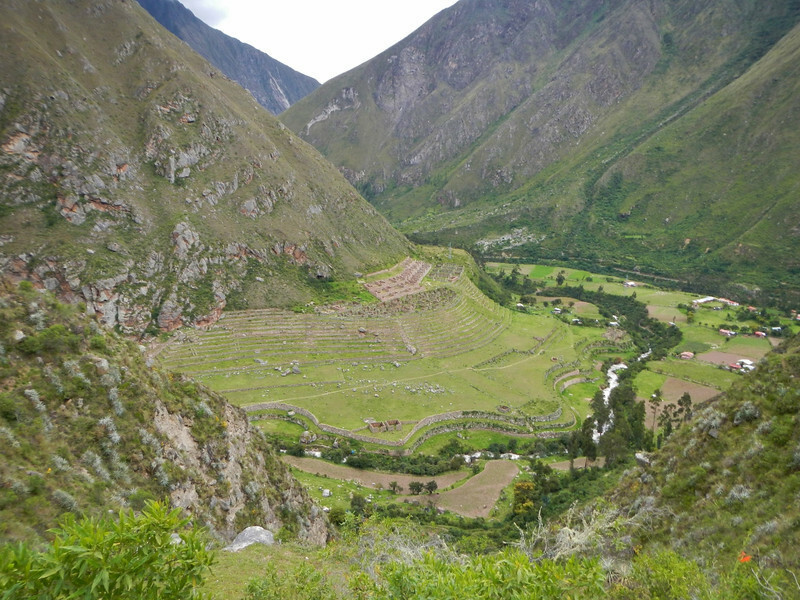 Today it is the most popular tourist spot in Peru, the government limits the number of visitors to 2500 per day. As you can imagine, our experience was much different from theirs. Dave and Keith had such an incredible time in 1962 that they didn’t want to go back and see the commercialization of the site. They encouraged us to make our first time visit but they decided to ride south and we agreed to catch up later. 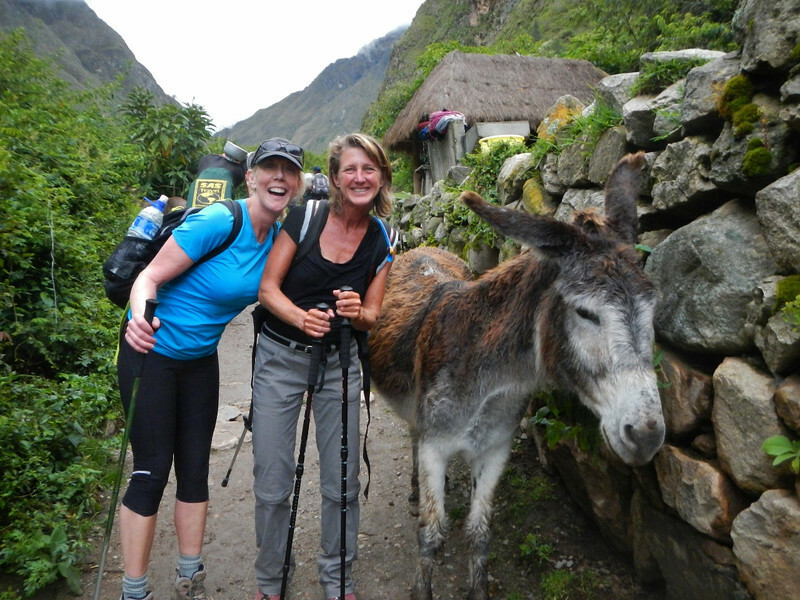 Most people who visit Machu Picchu, 2000 to be exact, do it as a day trip. 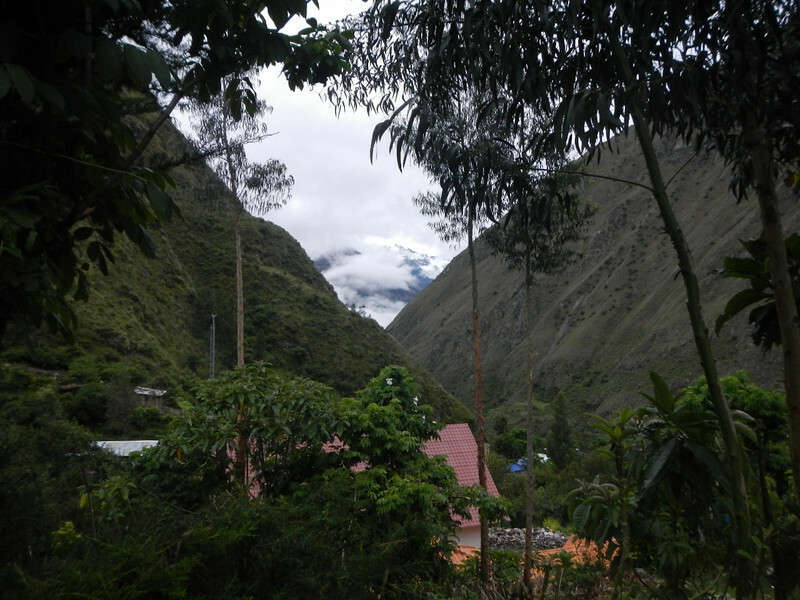 There is a bus and train option from Cusco or one of the nearby cities. 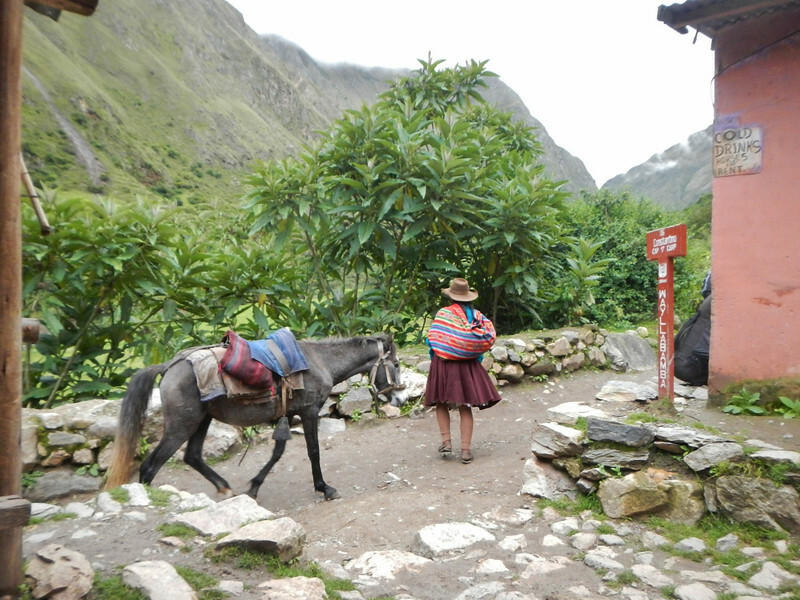 The other way to visit Machu Picchu is to hike the Inca Trail. 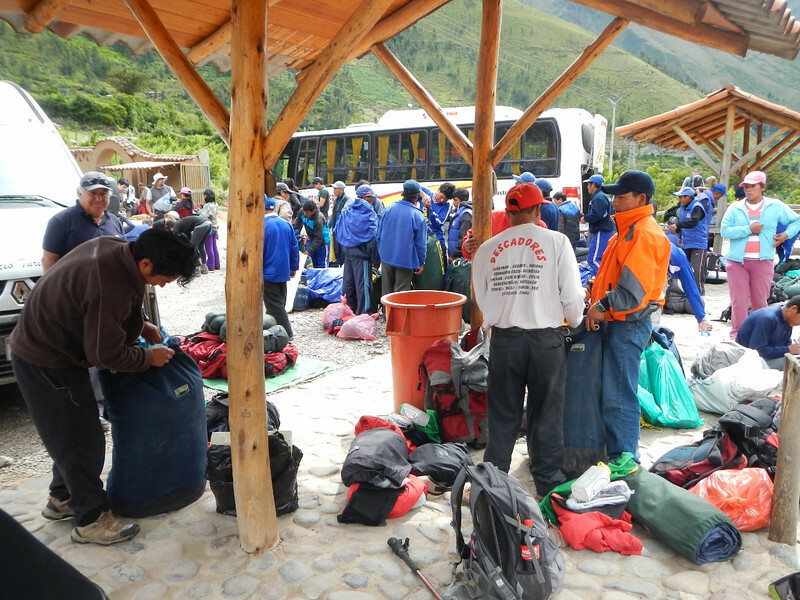 The government allows 500 people per day to depart on the four day hike. Guess what route we took? Richard, our guide, was waiting for us at 6:30 AM on Tuesday in the hotel lobby. We had been up for a while storing our luggage, drinking coffee and getting our provided backpacks and duffel bags ready. We met Richard the night before when he came to our hotel for a pre-hike briefing. 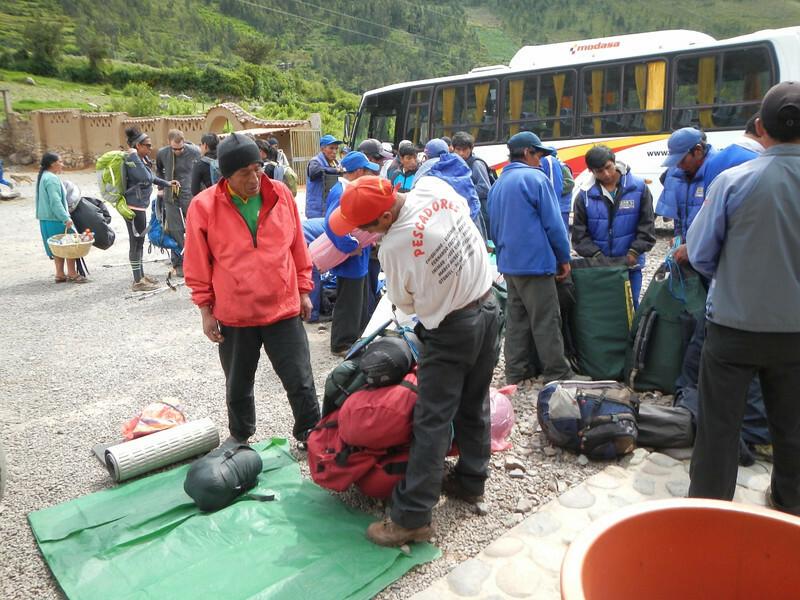 We would carry the backpacks with water, snacks and what ever personal items we thought we would need, and the porters would carry our duffel bags which contained our provided down sleeping bags and up to 10kg of other stuff we might need. I liked the plan. We rode in van for a couple of hours on our way to the starting point of the hike. Along the way we picked up porters until we had 4 hikers, 1 guide, 5 porters and the driver with all our gear loaded in the relatively small van. We stopped at a small town on the way for the porters to purchase food to last 4 days on the trip. Finally,at the trail head we stopped to pack the gear. We weren’t alone, there were many groups, most much bigger than ours. By about 10:30 we were at the starting gate, ready to go! 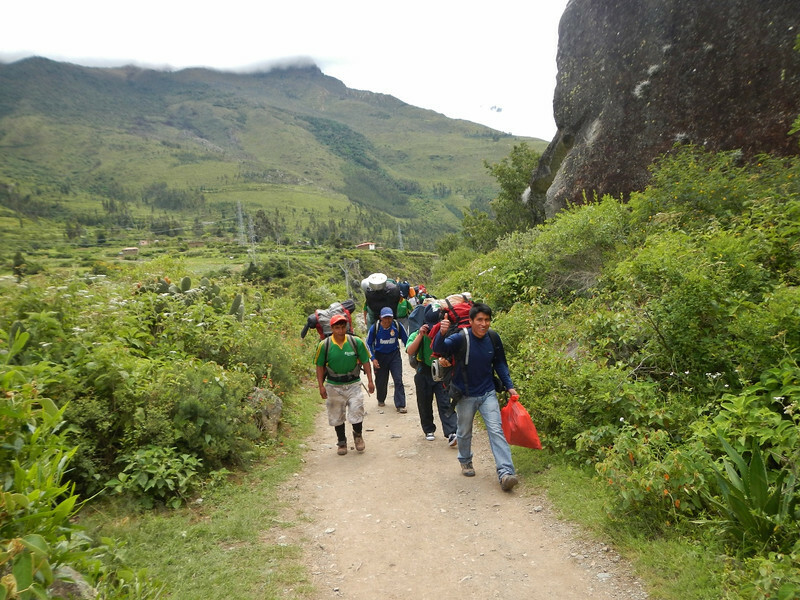 The trail starts off really easy, the guys with the big packs are the porters, the guys with the wimpy packs are the tourists, and the guides. The weather was just right and the views were fantastic. It wasn’t long before we stopped for lunch. 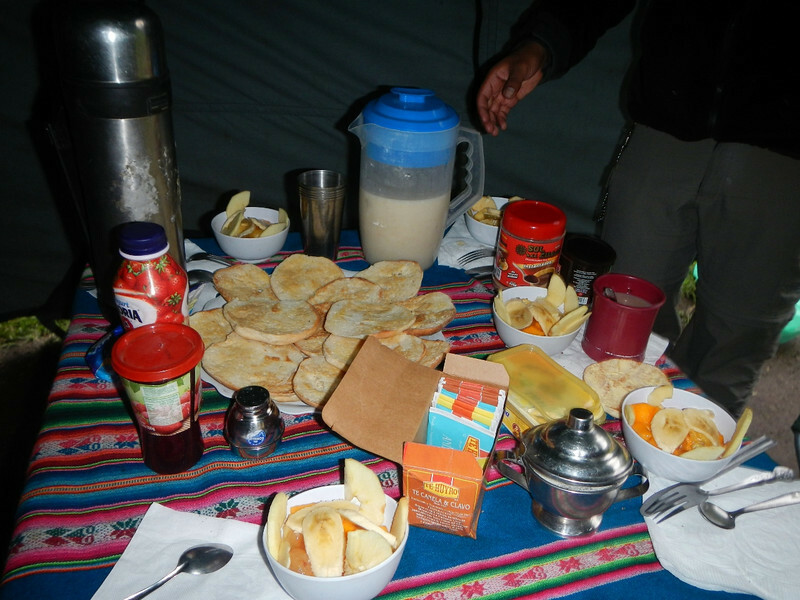 The porters run ahead and set up the tent, cook lunch and have it all waiting for us along the trail. Hmmm, I’m going to like this! Back on the trail we meet some of the locals. This lady was coming back from the bar where she downed a few checha’s, the local corn brew. Still close enough to civilization, we had opportunities to buy drinks or rent a horse. Had we seen this the next day I would have opted for the horse. After 7.3 miles of hiking we came to our camp for the night. 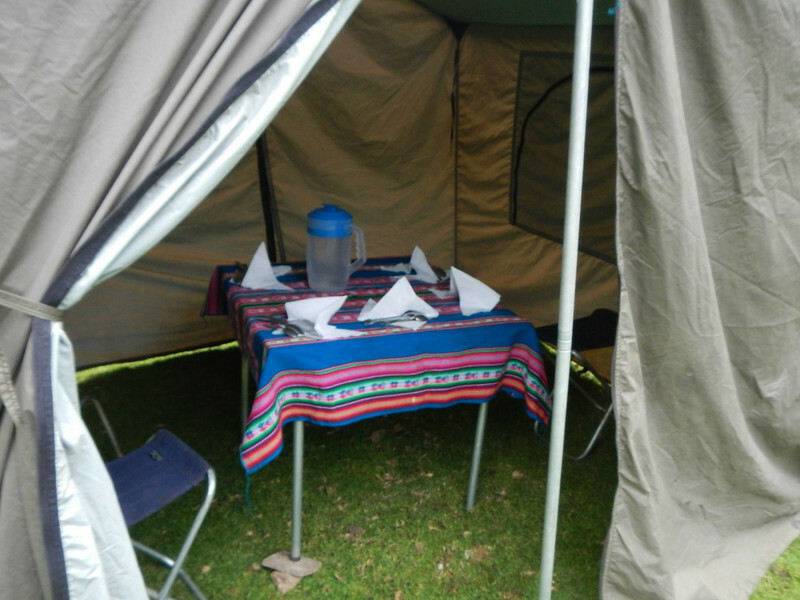 Tea was waiting for us at our private mess tent. Did I mention how much I like camping like this? Our tents were ready with the air pads blown up and duffel bags delivered. 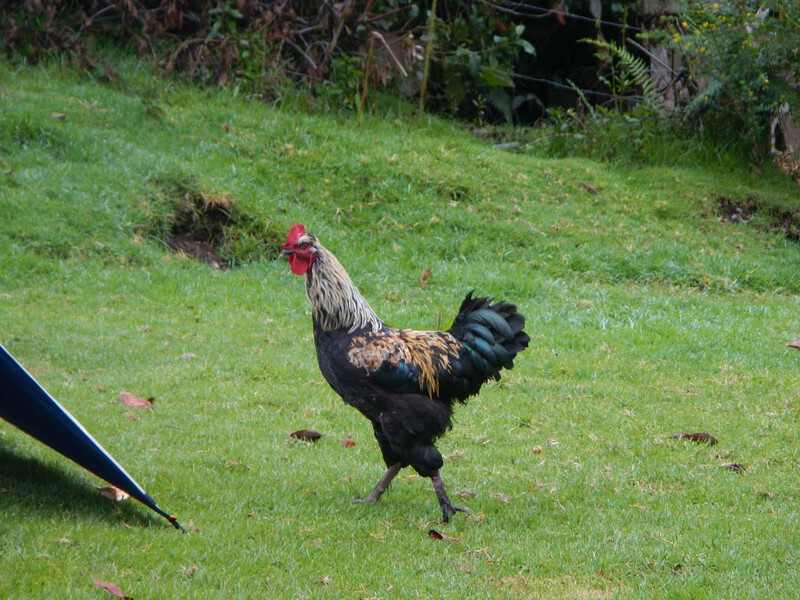 One of the locals came to check us out. Dinner was served promptly 7:00. This was the view out my tent flap. The only problem we had was beer. There was no practical way to carry the quantity we needed, with ice, so we assumed we would have to be on the wagon for a few days. A hardship to be sure, but manageable. 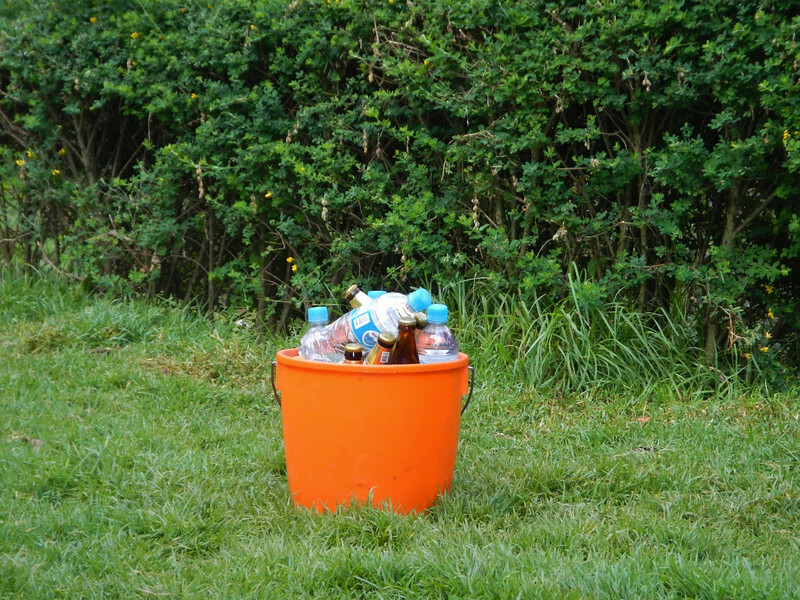 Then a miracle occurred, we looked out of our tent and this bucket of beer and water was there. No one knew where it came from but it looked OK so we each had a beer and filled our water bottles with the mineral water. Life was good! Ahhh, the end to a perfect day hiking. When it was dark I looked up and saw for the first time, the southern cross right in the middle of the milky way – wow. Of course the lyrics ran through my head…..
What a day, below is the elevation plot, we started at around 8,000 feet and ended up at close to 10,000 feet. 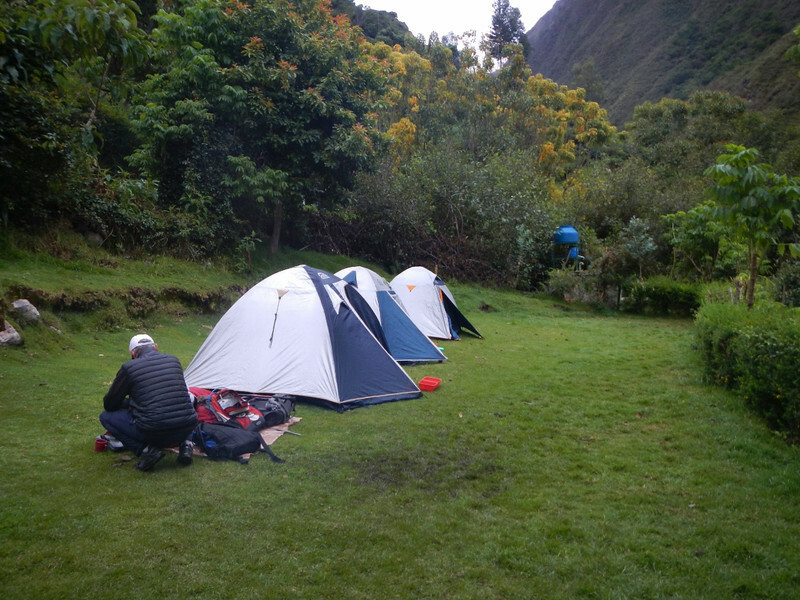 My acclamation time in Cusco was paying off, I felt great and drifted off into one of the best nights sleep on the trip. So, this seems like too long a post already so I’m going to stop here. Stay tuned, I’ll get the next post out soon! 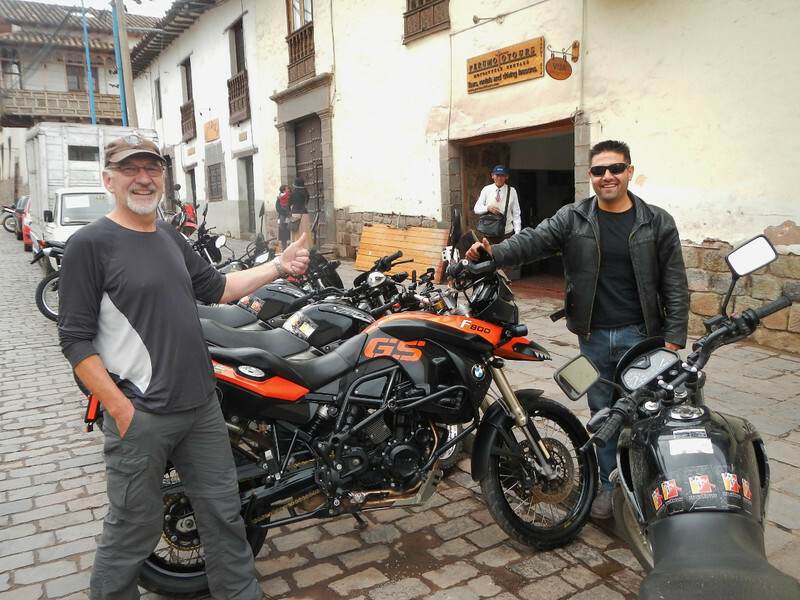 This entry was posted in 2013 Motoraid II, 2013 Peru, Motorcycle Adventure by donnh. Bookmark the permalink. Jim and I just read about your trip and were completely captivated! We would like to read more. I’d really like to get your starting blogs also. Good luck to you. You certainly are having the trip of a lifetime!! !